HAPPY NEW YEAR! 2010 Has Arrived! Wishing you a happy, healthy, safe, sane, prosperous (with genealogy as well as financially) and WONDERFUL New Year! Bloggers are reflecting on this past year, both with their accomplishments and with resolutions for the new year. I too have a couple of reflections, maybe a bit different from the norm. I am going to call them my eye openers. Things I am a bit disappointed with actually. I remember many years ago, my mother making a comment after looking at some of my vacation pictures. This was pre-genealogy time. She asked where the pictures were that I was in. At the time I didn't think much of it, but realized most of my pictures were taken of scenery probably taken on a motorcycle trip. 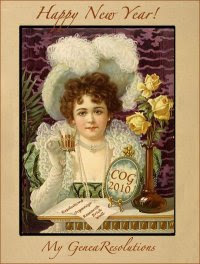 The topic for this edition of the Carnival of Genealogy is: New Year's Resolutions! The following post is written as my contribution to this COG event which will be hosted by Jasia at Creative Gene. How many of us make New Year's Resolutions every year? I have to admit I have been one of those resolution makers over the years. When I look back I have found that I start out gung ho and eventually peter out. During the past year I noticed some diligent genea-bloggers checking on their New Year Resolutions for 2009 during the year. When I read those posts, I didn't even want to look at my resolutions for 2009. Months had passed and I hadn't been focused on them. Wishing you a very special Christmas that you will remember forever. Enjoy your families, be happy, stay healthy and by gosh, go ahead and eat to much! Hope all of your Christmas dreams come true. Thank you for being my blogging friend, I send bunches of Christmas Kisses to YOU! Every year that I can remember growing up we spent Christmas Eve with my maternal grandfather. At least the evenings were spent there. But, once I was on my own in the world there were many different places I have spent Christmas Eve. When my husband and I were first married we spent the evening with some close friends of his. They did their Christmas celebration on Christmas Eve. I used to feel like we were intruding, but the family always made us feel so welcome. One year my husband's nephew started having his family Christmas on Christmas Eve and invited all of the family. We would bring a dish to share and they always supplied the meat and many other fixings. A white elephant exchange was great fun we shared and we watched as that part of the family opened their gifts. Eventually, those gatherings stopped though. Other than receiving many jewelry items over the years my fondest memories come from my husband. The most favorite of all is when he talks about how my family treated him and his daughter when they attended their first Christmas with my family. At the time it was a real new relationship. He felt uncomfortable about coming to my parents for the Holiday, but he found they were treated like they were always part of our family, gifts and all. This post will be short and sweet. In my home growing up, we never talked much about the deceased. Of course I was very fortunate to have so many grandparents alive during my growing up years. I, unlike most, had 5 sets of grandparents and that doesn't include great-grandparents. Two great grandparents were alive as I grew up that I can remember well. When they passed away, they were spoken of occasionally, mostly when we remembered something special about that person. Holidays for us were to have good times and the deceased were never brought up during that time. Much of the music I listened to growing up during Christmas time were tunes sung by Frank Sinatra and Dean Martin and that era of entertainers. One year for Christmas I received an album of Elvis's and I thought I was hot stuff. I think I listened to that album until I couldn't play it any longer. Was it Christmas music? No, but I had to throw this in! I enjoyed listening to all of the traditional songs while growing up. My favorite song was White Christmas. Growing up listening to music during the holidays has always put me "in the mood." 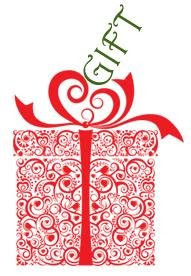 I especially love listening to Christmas music when I am cleaning or wrapping gifts. The song I remember most that came out that my family had so much fun with was, "Grandma got run over by a reindeer." We all made fun of the song and even my grandma laughed like crazy when she heard it. I think we all walked around with that song in our heads for a long long time. My family didn't grow up very religious. My extent of church going amounted to Vacation Bible School once a year. I always hated going. I felt so out of place and behind, not understanding at being at an equal level with my peers regarding religion. Needless to say, I never attended any religious services growing up. I am of the Luthern denomination, and am married to a Catholic. I have attended a couple of midnight masses with my husband. They are beautiful, and the church is always packed. He attends them every year and goes to church every Sunday and prays for me. I need all the help I can get! I generally choose not to go to the services because I am always so tired and have so much to get ready for on Christmas day as everyone comes to our house for gifts, breakfast and then dinner. Of course I have always been a working girl and time was limited. You never know, I just may start attending Christmas Eve's midnight mass again now that I am a retired woman! I never had a Christmas stocking while growing up. None of our family did. It wasn't part of our traditions. I wonder if my mother ever had Christmas stockings growing up? Times could have been tough and she may have grown up without them also. When I became pregnant I made the decision I wanted to have Christmas stockings. My in-laws at the time all had stockings, so I suppose that is where the desire came from. I made my daughter hers and as a matter of fact I made mine and her father's also. Her stocking consisted of two small children, a boy and a girl, by the Christmas tree, stairs off to the side, with a puppy on the scene and presents all around. 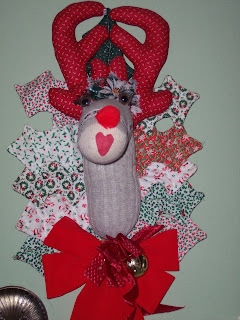 This stocking was made of felt and sequins and is the same stocking she has today at our home. She refuses to have anything different. Movies, so are you thinking I am talking about the movie theater? That could be a possibility, and not a bad one at that. This time though I am talking about 8mm movies. Do you remember those? As long as I can remember my father has been ever so faithful in taking movies at Christmas. Seeing these movies is always such a treat as we don't get to see them often. The problem now is that time has moved on. As with other electronics devices, movie cameras are not what they use to be. My father took movies using 8mm film. We used to watch those movies of Christmases past on a pull down screen that was on a stand. Sometimes we would watch these movies on a nice white wall. No matter how we watched them, they were always great. Seeing family members that are no longer with us, and revving up those memories of the past can be fun and emotional. It's time for blog caroling! I love the fact that I am at home in my jammies, slippers, and Santa hat (no makeup) sipping my hot toddie (mmmmmm) and singing to the world! The best part is that no one can tell how out of tune I am! The event is "FOOTNOTEMAVEN'S TRADITION OF BLOG CAROLING!" She has challenged us GeneaBloggers to blog our favorite Christmas Carol. I have to admit that this isn't my favorite Christmas Carol, but for several reasons, it keeps popping up this year to me, so I have been practicing for you for about a week, maybe by now I will even be in tune! Come on, sing along! I was very shy when I attended school. You wouldn't have caught me in a play of any kind. I would have made myself ill just at the thought of participating! I do not have recollections of anything special during school time for the holidays. We may have had a classroom party when I was in elementary school, but beyond that there wasn't anything special that I can remember. My grandfather was in a play when he was in high school, but I am almost positive it wasn't a Christmas play, the picture I own doesn't portray a holiday scene at all. Whose to say that at some point and time he wasn't in a Christmas play or pageant? My grandfather was quite a character and I can totally vision him participating in a play. His son was no different, in fact he may have been even more of a character. I spent quite a bit of time looking for the photo of my father who played a wise man in a school Christmas play. I was very disappointed when I couldn't find it. 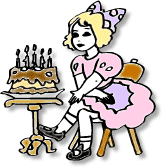 During the months of December and January there are many birthdays. I don't believe these people get a fair shake. Unless as a child their parents were smart and kind enough to give them a party or birthday gathering at another time of year. I know a couple people whose birthday's are on Christmas Day. One will celebrate her birthday in the spring, which I think is awesome as she will celebrate her 3rd birthday. Another is an adult and I have no idea how this birthday will be celebrated. I also know someone whose birthday is New Years Eve, and one whose birthday is 6 days prior to Christmas. These two people are adults now. How were their birthday's celebrated when they were children? And now? Now, I believe they celebrate on their actual birthday, as children I am not sure if they had other special dates for when they celebrated. Advent Calendar Day 14 ~ Fruitcake - Friend or Foe? Fruitcake? It isn't a friend of mine, nor my family. 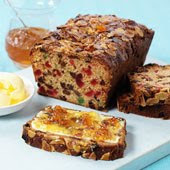 I remember buying a fruitcake or two for gifts years ago, but only for people who really liked them. Fruitcake rates about the same as mince meat pie in my books. Mincemeat pie has a name that doesn't even sound appealing. At least fruitcake can sound half way appealing. 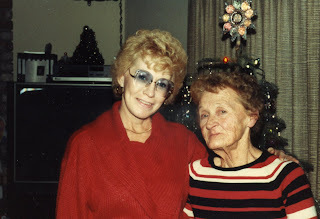 My mother and grandma (McGuire) Helman. I didn't make the trip, but my grandmother, Lois Helman did. In the early 1980's my ex and I decided to surprise my father and have his mother flown here for the Christmas Holidays. I never remembered spending a Christmas with her. We bought her the plane ticket and she was thrilled and very willing to keep the secret from her son. She flew in a few days before Christmas from Arizona and spent time with us. It was so wonderful to have her in my home, very special indeed. I had never had a family member stay with us before, except for maybe my youngest sister. Grandma enjoyed the time she could spend with her great granddaughter and me. We had been pen pals over the years and were close. As a family we never volunteered to work for a charity. My husband and I have however done charity work through the Harley Davidson Chapter we belong to. 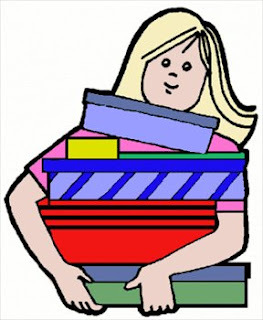 Our chapter supports a local home for battered women and children. Christmas time is when our support is really shown. In fact, you could say this is why I joined the chapter to begin with. You see, about ten years ago I heard about a toy run the chapter was sponsoring. Friends of ours belonged to the chapter and shared the information with us. When I heard the support the chapter gave for the needy, I was sold. My husband had been wanting a Harley. I gave him the down payment for the bike at Christmas, I wanted us to join the chapter. I have no idea what traditions were at Christmas for any of my grandparents or great grandparents. I do know there were two things that were traditions in my parents home on Christmas. The first one was that we didn't get to open out presents until 1:00pm on Christmas Day. I suppose growing up and being used to that wasn't as bad as others may think, that was just the way my mother did it. She would get up in the morning, start the turkey (we always had turkey) and do some cooking. My mother's mother and her husband came to our house for Christmas Day, and they came at one o'clock. Looking back on this, I think it is amazing I didn't fuss about it as I can't imagine ever having my children wait until that time to open their gifts. My children put out milk and cookies on Christmas Eve, I don't know if that was ever done in my parents home, I can't remember it if it was. The most distant memories I have were those spent Christmas Eve with my grandparents and aunt and eventually her family. My grandpa Harding was the sweetest ever. He was always so happy and made us feel special and so very comfortable around him. He was the one who decorated the Christmas tree for many years, until they finally put it, decorations and all in a spare bedroom, covered with a sheet waiting for the following year. My grandfather played Santa and handed out the gifts. 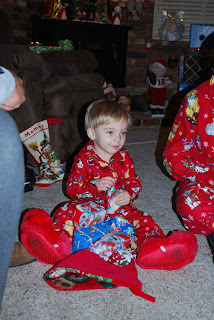 He truly enjoyed watching us open each gift as if he had gone out and bought it himself. I do believe though that my grandma did the shopping.She did the shopping, he wrapped. Today is "grab bag day", which means we are to choose our own theme for the day. The theme I have chosen is about being crafty during the holidays. The photo to the right displays a miniature scene I made years ago. It hasn't been unpacked for several Christmases. I developed the room you see in the display here. I started with wallpaper and then building the fireplace and decorating it. I crocheted a blanket to adorn the rocking chair. Toys were added along with lights to the tree (which needs batteries now) and pictures on the wall. As you can see there are also presents and a rug...and it was so much fun to make! Here I was wishing her a congratulatory Merry Christmas on being connected with her father and sister again, and found out it is her birthday! So, she was reunited with her family as a birthday gift! I wanted you to know that I am praying for you and your health. Remember, as you told me, you now have hope. Please keep that hope, great things do happen! You already can attest to that! Be strong and get lots of rest. May you have the happiest birthday EVER! Traditionally, Norwegian and Danish baked at least seven different types of cookies before Christmas. It carried over from the 19th century. It seemed that the more types of cookies you baked the wealthier you were. Scandinavian cookie recipes were handed down from generation to generation, but not in my immediate family. There was never cookie making when I was a child growing up. I am starting to feel as though I missed so much as a child. At least I have memories to share of Christmas cookies and baking as an adult, along with a new tradition. The first time I was really involved in baking Christmas Cookies was about 25 years ago. A friend hosted a Christmas cookie and tea party. The idea was to bake 6 dozen of one kind of cookie. Then we would meet for cookies and tea and exchange a dozen of the cookies we baked with each of the other five people. Suddenly we had 6 dozen different home made cookies! 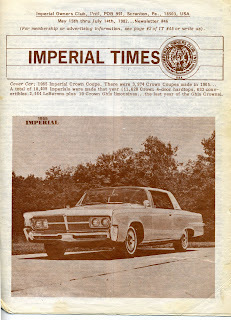 Saturday Night Genealogy Fun with Randy Seaver over at Genea-Musings prompted me to write the first of these two posts. The challenge and my response can be read here. It is highly recommended you read that post before continuing on with this, my follow up letter to Genea-Santa! I can not begin to tell you how awesome a gift this was from you! The fact that you were able to grant my wish was amazing. Thank you from the bottom of my heart! Because of you, my good friend Joe Dallman and I were able to crack this case and bring my friend back in touch with her father, Clay Thomas Carlin. We were looking for his final resting place, and instead we found that he is very much alive! In fact he was looking for her also. The phone call between the two happened this afternoon and my friend wrote me this while she was speaking to him.